In 1914, Industrialist Henry Ford began to combine his paternalistic interest in social engineering with the huge profits Ford Motor Company was making annually. In fact, one of his ideas quite simply revolutionized American Capitalism by doing something really radical. Ford had been examining the ways in which a company could reinforce positive behavior in its employees. At the same time, he wanted to redefine worker compensation as an asset of the company by investing some of the company’s profit back in the workforce. These thoughts would lead to the creation of a MINIMUM WAGE of $5 a day salary for every employee of Ford. Well, not exactly EVERY employee. This was a benefit that would be made available to married men only. His theory was that if you gave an employee with financial obligations a sufficient salary, their increased disposable income could help make them a more active consumer in the American economy. Translation: these employees might be able to afford a Model T, thereby increasing Ford’s market share. Although Ford’s idea wasn’t completely altruistic, the results he had predicted did occur. More and more of Ford’s employees were able to begin lifting themselves out of poverty. On February 12, 2013, President Barack Obama called for an increase in the minimum wage from $7.25 an hour to $9. In 2008 he had ran on a platform of $9.50 but why quibble over .50¢? President Obama’s proposed increase is designed to do the same thing as Ford’s; provide employees with a living wage that helps them participate in the American economy. This would lead to more jobs being created and economic growth. The Conventional Wisdom in Washington, D.C. states that this idea is dead on arrival. Not to be touched by either Chamber of Congress. Why? The critics of increasing the minimum wage (Conservatives, Democrats in the pocket of Corporate America and the Chamber of Commerce) have said it will cost jobs, or worst, kill new job creation. This last one is hard to visualize since new job creation is at an all-time low for a period when companies are racking in record profits. Business owners, these critics say, could not withstand the increased cost of doing business and would be forced to actually cut jobs. Ironically, that is exactly what many of the Ford executives said to Henry in 1914. Instead of seeing their huge profit margins as evidence of a successful business model and sound financials that offered them a golden opportunity to take greater risk, they wanted to horde those profits. Today, the response is no different. It is amazing how the ideas of a conservative industrialist can be seen as a Socialism when viewed through the prism of partisanship. 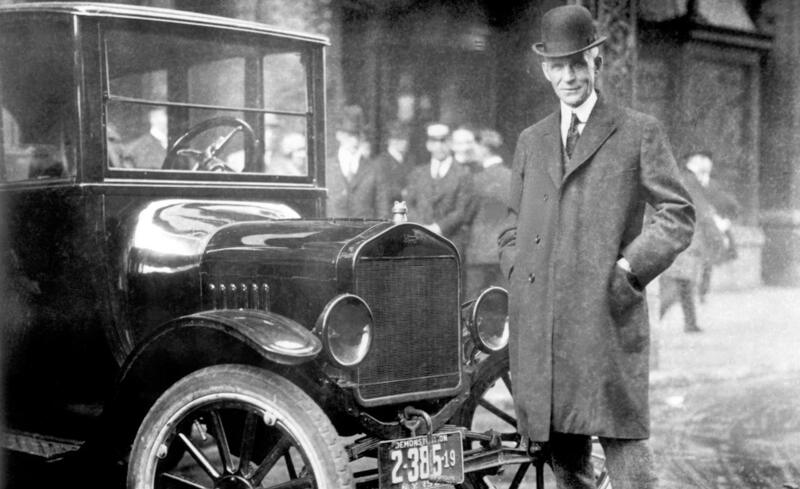 Henry Ford with a Ford Model T.
It has always amazed me how quickly the idea of raising the minimum wage gets dismissed when you consider parts of economic history such as this. But, as always, if there is even the slightest hint of leveling the economic playing field in a plan, it gets criticized and ignored as fast as possible so not many people will actually notice it and think it just might work. Previous Previous post: What Would Django Do?